Tonight as I was folding clothes from the dryer, I heard a familiar moan. It was the stretching moan that my little Missy makes when she stretches. But I didn't know where it was coming from...until I saw this little head peeking out. I started to laugh. She loves to be UNDER anything. Under the bed, under the covers, under, under under. She gets all nervous when I take pictures of her but I couldn't resist. 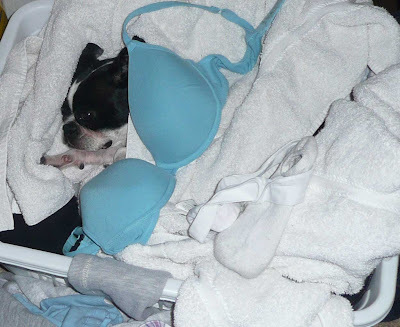 By the way....please ignore the blue bra...my daughter would be horrified that I took the picture with it there, but I didn't want to disturb my little princess and it serves her right for throwing her blue bra in the whites! That doggie is so darling, must love it inside all those clothes! And that bra is so pretty, it looks like art and like it's supposed to be there on top. See, it leads the eye back to the dog's face. A perfect composition. I think you meant to do that. Shh, your secret is safe with me! How the heck could we ignore a bright blue bra? that is just soooo sweet..
and .. the bra.. hehehe.. i love the color! This is SOO cute! 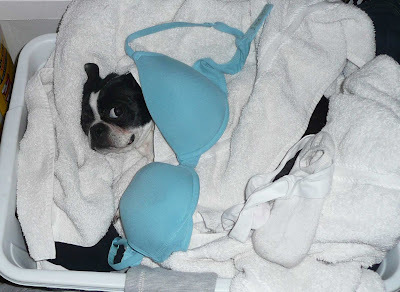 My dog never wanted under things and he was too big to get into the laundry (even though he was medium-sized) he had so much fur he liked cool places. That "say, what are you doing?" look is priceless! Caught in the act. My cats are always doing funny things and I wish my camera was in reach... by the time I get it they move or stop doing whatever. Great catch!